Faucet manufacturer Pfister says its Tenet Collection is a new line of modern faucets that strips away all unnecessary elements. “For 2019, we wanted to announce to the world these breathtaking pieces that haven’t been seen elsewhere, from the precision-engineered, elegant designs in our new bathroom faucets and accessories to our three new showerheads giving users an unparalleled showering experience,” says Darin Heuer, group marketing manager for Pfister, a division of Hardware and Home Improvement. Featuring 84 pieces, the Tenet collection has a sleek, modern design aesthetic. The company says the single-control faucet is designed to mimic the meticulous, purposeful essence of a fine watch, while the horizontal lever is mounted on the side, rather than the top. “Swiveling the lever forward activates water flow and changes temperature progressively from cold to hot,” the company says. The collection also offers a new Shower Integrated Rail. 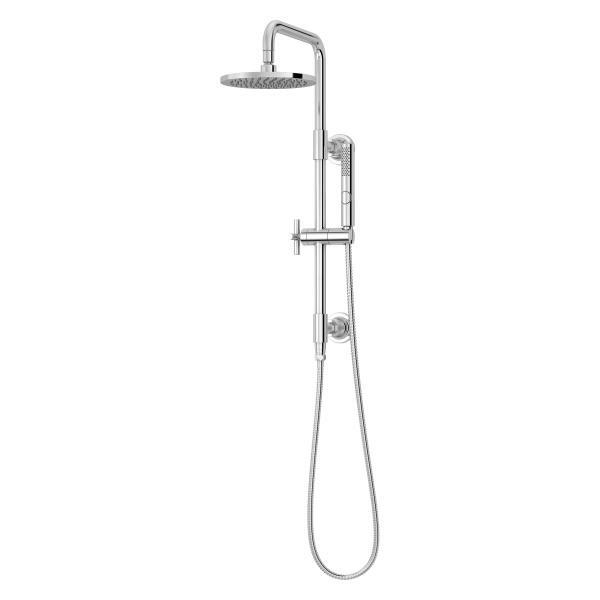 Ideal for retrofitting existing showers without altering plumbing or replacing valves or trim, the system allows the showerhead to be mounted directly on the slide bar. The hand shower diverter is also integrated into the hand shower so that the water diverts with an easy press of a button, the brand says. Available exclusively at plumbing supply retailer and distributor Ferguson, the producrts feature all-brass construction and come in Brushed Gold, Polished Chrome, Matte Black, and Brushed Nickel.